Instaflex Pain Cream Review – Is This Product Safe To Use? What is Instaflex Pain Cream? Instaflex Pain Cream is a cream that was designed for the purpose of relieving every form of pain or ache that you may come across in your day to day activities. It provides a range of benefits as stated by the manufacturer and helps you to regain your quality of life quickly. Unlike oral pain relief capsules, Instaflex Pain Cream is applied directly to the affected area of the body to relieve swelling, stiffness and pain. The official website for the product contains information about the product in addition to details about the developer of the formula, Dr Joe Pergolizzi. What is the Company behind Instaflex Pain Cream? Instaflex is the company behind Instaflex Pain Cream. Instaflex is a leading brand in the health product industry and specializes in the production of safe and potent supplements, produced from organic compounds with the purpose of boosting health and enhancing the wellness of the consumers. The manufacturer states that they make use of highest quality ingredients, and that their laboratories are GMP and FDA certified. The company is also involved in the production of other products and they have an established, official website. How does Instaflex Pain Cream work? Instaflex Pain Cream uses a key active ingredient that is said to reduce swelling, improve flexibility and increase overall range of motion. By applying it directly to the affected part of the body, the user may experience quick relief for all types of pain including backache, bruising, muscle stiffness and joint conditions such as arthritis. The patented oxygenated essential oil that is also used in the formula ensures that skin is well-conditioned and allows it to be massaged easily into the body for deep penetration. What are the ingredients used in Instaflex Pain Cream? Menthol – This is the only active ingredient used in the product. It is derived from volatile pennyroyal, eucalyptus and peppermint, and has been widely studied for its use in the relief of pain, stiffness and inflammation. Menthol has warming properties that reduce pain within minutes of application, although the effects are temporary. Many pain-relieving products contain this active ingredient and it is used in Instaflex Pain Cream at an amount of 1.25%. Oxygenated oil – This ingredient is derived by passing oxygen through the oil. Although it is not an active ingredient in the Instaflex Pain Cream it plays an important role, ensuring that the cream goes on smoothly and keeps the skin well-conditioned. It imparts a pleasant scent, according to the manufacturer, and is absorbed quickly into the skin without leaving a greasy feeling. 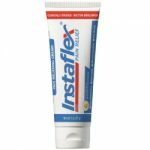 What are the Pros of Instaflex Pain Cream? Instaflex Pain Cream is a doctor-developed cream. It provides about twice the relief as opposed to a menthol-only cream. It may penetrate the skin deeply and quickly. It may provide fast relief from aches, strains and joint pains. The amount of menthol used in the formula is listed on the product label. What are the Cons of Instaflex Pain Cream? It is harmful when used on damaged skin or open wounds. It only contains one key active ingredient. Results are temporary and do not have a cumulative effect. It is dangerous when it comes in contact with the eyes. How should you use this Instaflex Pain Cream? Instaflex Pain Cream should be applied topically to the affected area a maximum of three to four times every day. Anyone under the age of 12 should seek their doctor’s advice before using the cream. How much does Instaflex Pain Cream Cost? Instaflex Pain Cream costs $17.99 per 2oz. tube and the manufacturer offers savings, free gifts and free shipping on larger orders. What is Instaflex Pain Cream return policy? The manufacturer offers a full 90-day money back guarantee for customers who purchase the product from the website. Does Instaflex Pain Cream offer a free trial? No. Instaflex Pain Cream is not available for a free trial. This product makes several claims as regards its benefits and advantages. It promises to provide almost twice the relief from pain as other creams would although it only contains one active ingredient. While it is reasonable to assume that this active ingredient may provide quick relief in terms of swelling and inflammation, it is a very short-term solution and wouldn’t be suitable for consumers with serious joint issues. Unlike many of the oral joint pain-relieving products on the market, Instaflex Pain Cream will have no effect on cartilage, bones and lubrication and will not be able to provide the cartilage-building benefits that most people require. Ultimately, this product would be best for anyone experiencing occasional pain from overuse or injury, but it certainly shouldn’t be viewed as a long-term solution for aging, vulnerable joints. Anyone seeking this kind of help would be advised to opt for an alternative product with a formula that provides a full range of beneficial joint health active ingredients, not just one.